Successfully Added Sentinel - Waterproof Night Vision CCTV (SONY 1/3 CCD) - PAL to your Shopping Cart. The Sentinel CCTV camera is strong, resilient and ever vigilant. With 108 LED's, an high grade aluminum body and a Sony 1/3 inch CCD lens, this wired CCTV camera will transmit crystal clear pictures to your security system no matter what the weather. The Sentinel is a CCTV surveillance camera with a unique design; three separate connected bodies with three IR (infra red) sensors, three banks of LED lights and one high grade camera. Concerned about security? Then you'll appreciate this highly thoughtful, durable and high-quality surveillance camera. The heavy-duty aluminum casing protects The Sentinel from water, stormy weather and falling debris. With the included mounting bracket, installing and positioning this camera is quick and easy. The Sentinel will guard with optimum efficiency, providing you with complete peace of mind about the safety of your home and business. With a clear resolution and a long viewing range, this powerful CCTV is perfect for keeping an eye on the outside of your home or business all day and night, rain or shine. 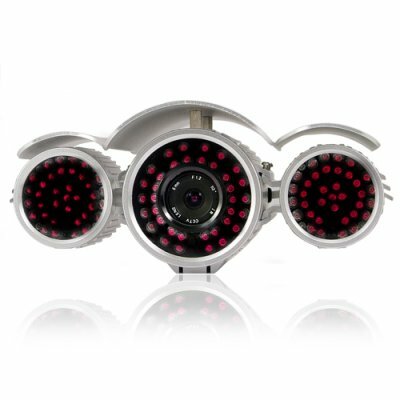 The 1/3 inch CCD Sony lens gives a high quality image and wide viewing angle, while 108 infrared (IR) LED's provide excellent night vision, even in complete darkness. The Sentinel is the perfect guardian for your home or business. For maximum security, buy several Sentinels for total all round protection and safety. The CVSH-I24-PAL (a.k.a The Sentinel) is brought to you by the leader in factory-direct wholesale electronics, Chinavasion. Note: The CVSH-I24-PAL supports PAL color systems. For NTSC versions, please see CVSH-I24-NTSC. Have Fun!. No. This camera has 3 light sensors that detects light levels. It switches to IR mode automatically. Do you always have to keep the computer on to be always on guard?